It's down to the wire, as we ready our Camaro race car for the track. 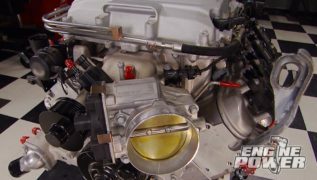 (NARRATOR)>> TODAY ON ENGINE POWER THE TRIPLE THREAT CAMARO GETS SOME COMPETITION CAR ESSENTIALS, INCLUDING A RACE APPROVED SHIFTER, A POWERFUL STARTER, AND MORE. 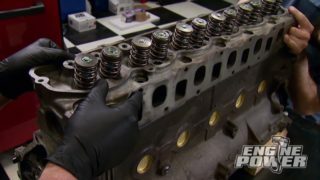 PLUS TWO GREAT OPTIONS FOR MAKING AFFORDABLE LS POWER, AND PAT GETS AN EARLY CHRISTMAS PRESENT AND IT'S JUST WHAT HE WANTED. 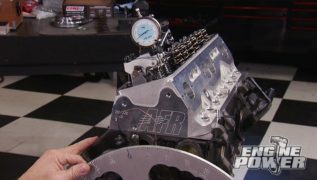 (MIKE)>> WELCOME TO ENGINE POWER. TODAY WE'VE GOT A PACKED SHOW. WE'RE GONNA START OUT WORKING ON THE TRIPLE THREAT CAMARO. 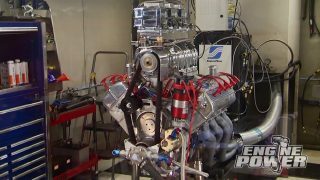 THEN WE'RE CHANGING GEARS AND HELPING OUT THE GUYS AT POWERTRAIN PRODUCTS INTRODUCE THEIR FIRST PERFORMANCE CRATE ENGINE. AFTER THAT WE'RE MOVING IN A BIG PIECE OF EQUIPMENT FROM SONNEN THAT PAT AND I ARE BOTH SUPER EXCITED ABOUT. (PAT)>> OUR TRIPLE THREAT CAMARO HAS BEEN A FUN PROJECT, AND LOOKING BACK IT'S MADE A BUNCH OF MEMORIES FOR US. ABOUT A YEAR AGO WE SAW AN ONLINE AD FOR IT FROM A GUY IN LOUISVILLE THAT WAS TRYING TO SELL IT. SO WE MADE THE TRIP AND IT WAS WELL WORTH IT. 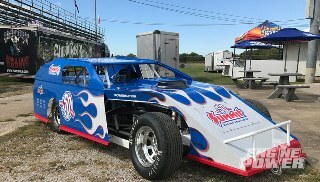 AS SOON AS WE LAID EYES ON THIS CAR WE KNEW IT WAS COMING BACK TO THE ENGINE POWER SHOP. THAT'S WHEN THE WORK STARTED. BIG THINGS WERE REMOVED, LIKE THE ENTIRE FRONT SUBFRAME, THE REAR LEAF SPRINGS AND AXLE ASSEMBLY, SOME OF THE INTERIOR, ALL MAKING WAY FOR TRICK NEW PARTS, LIKE THIS SRG FORCE CHASSIS FROM STREET ROD GARAGE. A ONE PIECE DESIGN THAT ELIMINATES THE STOCK FRONT SUBFRAME AND REAR LEAF SPRING SUSPENSION. WE HAD IT POWDER COATED AT MISTER SPEED COATINGS. THEN BROUGHT IT BACK TO THE SHOP WHERE THE NEW MARRIAGE HAPPENED. (MIKE)>> WITH ALL THOSE KILLER PARTS WE HAD TO BUILD A STOUT POWER PLANT, AND THAT'S EXACTLY WHAT WE DID. IT'S A WORLD PRODUCTS MOTOWN TWO LS. NOW THIS THING IS ALL SMALL BLOCK CHEVY FROM THE DECK DOWN, AND UP TOP WE MOUNTED A SET OF TRICK FLOW GENX 260 LS SEVEN HEADS. YES YOU HEARD IT RIGHT. THIS SETUP ACCEPTS ALL LS INDUCTION. SO IT GIVES US THE BEST OF BOTH WORLDS, STRENGTH DOWN LOW AND FLOW NUMBERS UP TOP. 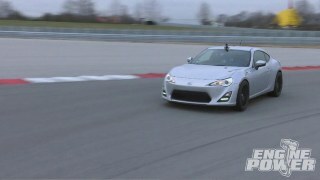 (PAT)>> LOOK AT THAT, ENGINE GUY DOING SHIFTER WORK. LUCKY FOR US THE STOCK SHIFTER CABLE BOOT IS IN THE CORRECT LOCATION FOR OUR SHIFTER. (PAT)>> SOLID, AND NOW THE REAL TEST TO SEE IF THE CONSOLE STILL FITS LIKE IT SHOULD, AND IT DOES. NOW ALL WE HAVE TO DO IS MAKE A PLATE THAT COVERS UP THE HOLE IN THE SHIFTER AND WE'LL DO THAT A LITTLE LATER. 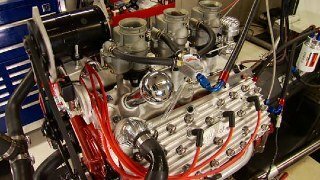 TO TURN OVER OUR 440 CUBIC INCH SMALL BLOCK WE GAVE PERTRONIX A CALL AND THEY SENT US ONE OF THEIR CONTOUR SERIES STARTERS. THIS IS A FULL ENCLOSED DESIGN THAT PROTECTS THE SOLENOID AND OTHER KEY COMPONENTS FROM HEAT AND THE ELEMENTS. IT'S VERY COMPACT AND CAN BE CLOCKED TO CLEAR DIFFERENT HEADER DESIGNS. 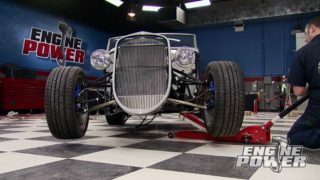 IT'S MADE OUT OF ALL NEW PARTS AND HAS A FOUR POINT FOUR TO ONE GEAR RATIO THAT PUTS OUT OVER 200 POUND FEET OF TORQUE. IT'S AVAILABLE FOR DIFFERENT ENGINE COMBINATION, AND IS EVEN DESIGNED TO START HIGH COMPRESSION BULLETS. AND A FEW BOLTS BACK IN THE STOCK LOCATIONS AND WE HAVE A SLICK INSTALL. ONE OF THE MOST IMPORTANT THINGS TO CHECK WHEN INSTALLING ANY AFTERMARKET CABLE SHIFTER IS ITS FUNCTION. THEY GIVE YOU A BUNCH OF DIFFERENT BRACKETS BECAUSE THE SHIFT FITS A MULTITUDE OF TRANSMISSIONS. SO HERE'S A WAY TO CHECK TO MAKE SURE IT'S ADJUSTED CORRECTLY. WITH THE SHIFTER RATCHETED TO ITS FULL REAR POSITION, WHICH ON THIS TRANSMISSION IS HIGH GEAR, WE'LL CHECK THE ENGAGEMENT OF OUR GEAR SELECTOR, AND IT SHOULD BE FREE AND BE ABLE TO SLIP IN AND OUT WITH NO PROBLEM. RATCHETING UP ONE GEAR PUTS US IN SECOND, AND AGAIN THE PUCK SHOULD MOVE FREELY IN AND OUT OF THE GEAR SELECTOR. RATCHETING UP ONE MORE IS LOW GEAR, SAME THING. NOW ALL WE NEED IS A COTTER PIN TO HOLD THE CABLE IN PLACE. (NARRATOR)>> UP NEXT, TWO WORDS THAT MAKE ANYTHING BETTER, CARBON FIBER! (MIKE)>> WE'RE BACK AND IT'S TIME TO RUN THE NEGATIVE AND POSITIVE CABLES FROM THE BATTERY TO THE CHASSIS AND THE STARTER. FIRST UP IS PASSING THE CABLES THROUGH THE HOLES I DRILLED IN THE FLOOR PAN. THERE ARE RUBBER GROMMETS TO AVOID ANY DAMAGE TO THE CABLE. IF THE POSITIVE CABLE RUBS THROUGH TO METAL YOU'RE GOING TO HAVE A ROMAN CANDLE ON BOARD. THE GROUND CABLE IS GOING TO THE CHASSIS. A HOLE IS DRILL THROUGH THIS PLATE. THEN A SMALL AREA IS CLEANED TO BARE METAL TO PROMOTE A GOOD GROUND CONTACT. THE POSITIVE WILL ROUTE TOWARDS THE FRONT OF THE CAR, SECURING IT WITH CUSHION CLAMPS AT DIFFERENT LOCATIONS. TO KEEP IT AWAY FROM THE FLEX PLATE AND EXHAUST THIS CLAMP WAS INSTALLED TO POSITION THE CABLE IN A SAFE SPOT. NOW THE TERMINAL IS FASTENED TO THE END OF THE CABLE AND IT ATTACHES TO THE LARGE STARTER POST. I AM ALSO INSTALLING A GROUND FROM THE ENGINE BLOCK TO THE CHASSIS. THIS IS A MUST FOR A PROPERLY GROUNDED VEHICLE. ONE END GOES DIRECTLY TO THE BLOCK, THE OTHER TO THE CHASSIS JUST LIKE THE BATTERY GROUND. (PAT)>> THE NEUTRAL SAFETY SWITCH IS AN IMPORTANT SAFETY FEATURE OF ANY VEHICLE BECAUSE IT PREVENTS IT FROM STARTING IN EITHER FORWARD OR REVERSE. HERE'S A LOOK AT HOW THE SYSTEM WORKS. IT ALL STARTS WITH THE IGNITION SWITCH. A HOT LEAD GOES ONTO ONE SIDE OF THE NEUTRAL SAFETY SWITCH, WHICH IN OUR CASE IS ON OUR B&M SHIFTER. THE OTHER SIDE HAS A LEAD THAT GOES DIRECTLY TO THE STARTER SOLENOID. THIS IS THE TRIGGER WIRE THAT SENDS A POSITIVE SIGNAL SO THE STARTER CAN TURN OVER. NOW THE SHIFTER'S POSITION IS WHAT ACTUATES THIS SWITCH. SO IT HAS TO BE IN EITHER PARK OR NEUTRAL FOR IT TO FIRE IF THIS IS WIRED UP PROPERLY. (MIKE)>> THE ORIGINAL NEUTRAL SAFETY SWITCH WIRES IN THE HARNESS ARE PURPLE. NOW THESE TWO HEAVY RED LEADS ARE TIRED INTO THOSE AND WILL GO TO THE NEUTRAL SAFETY SWITCH ON THE SHIFTER. THIS GREEN AND PINK SET OF WIRES IS FOR THE REVERSE LIGHT SWITCH THAT WAS ORIGINALLY MOUNTED DOWN ON THE STEERING COLUMN. NOW THESE WIRES ARE TIED INTO THE FACTORY HARNESS AND WILL COME TO THE PIGGYBACK SWITCH UNDERNEATH THE NEUTRAL SAFETY ONE. INSTALLING THE FEMALE SPADE CONNECTORS ALLOWS THE WIRES TO ATTACH TO THE NEUTRAL SAFETY SWITCH THAT IS ON THE BOTTOM AND THE REVERSE LIGHT SWITCH ON THE TOP. WE JUST RECEIVED A PIECE OF THE CAR BUILDING PUZZLE WE'VE BEEN WAITING ON FOR A COUPLE OF WEEKS. IT'S JUST AS IMPORTANT AS THE ENGINE, THE TRANSMISSION, AND THE REAR END BECAUSE WITHOUT IT NONE OF THOSE PARTS CAN BE LINKED TOGETHER. NOW IT WAS A CUSTOM ORDER PIECE FROM QA ONE THAT WE SPEC'ED OUT BASED ON SEVERAL MEASUREMENTS AND SOME PRETTY SPECIFIC FACTORS. QA ONE HAS AN ORDER FORM YOU CAN PRINT FROM THEIR WEBSITE THAT GUIDES YOU THROUGH ALL THE MEASUREMENTS YOU WILL HAVE TO SUPPLY THEM. MEASURING NEEDS TO BE DONE WITH TWO PEOPLE. MAKE SURE THE TAPE IS PULLED TIGHT AND THE MEASUREMENTS ARE TAKEN TO WITHIN A 16TH OF AN INCH. FILL IN THE SHEET AS YOU GO. MAKE SURE TO DOUBLE CHECK YOUR MEASUREMENTS. CARBON SHAFTS CANNOT BE SHORTENED, AND I GUARANTEE YOU YOU WON'T GET A SECOND ONE BUILT FOR FREE. (PAT)>> WE FILLED OUR SHEET OUT AND HAD THIS THREE INCH, 200 DIAMETER CUSTOM REV SERIES CARBON SHAFT MADE FOR THE CAMARO. NOW THESE ARE WOUND IN HOUSE AT QA ONE USING THREEM MATRIX RESIN THAT'S SPECIFICALLY DESIGNED FOR PERFORMANCE USE. THE YOKES ARE A PRECISION CNC MACHINED FORGED PIECE SPECIFICALLY DEVELOPED FOR QA ONE'S 11 STEP BONDING PROCEDURE. 13-50 HIGH STRENGTH ALLOY UJOINTS ARE USED FOR MAXIMUM PERFORMANCE. THE SHAFT IS HARMONIC TESTED, PRECISION BALANCED TO ENSURE ITS SMOOTH, VIBRATION FREE OPERATION, AND IT IS TORSION TESTED. IT IS SERIALIZED BEFORE IT LEAVES. AND SFI CERTIFICATION IS OPTIONAL. WE GOT OURS WITH A 43.1 RATING. THIS SHAFT WILL HANDLE 2,000 HORSEPOWER AND 1,500 POUND FEET OF TORQUE. 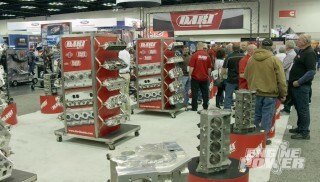 (NARRATOR)>> UP NEXT, POWERTRAIN PRODUCTS INTRODUCES THEIR BRAND NEW LS LINE UP. 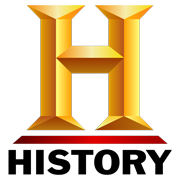 (MIKE)>> WE'RE BACK AND MOVING ON TO A NEW ELEMENT IN TODAY'S SHOW. 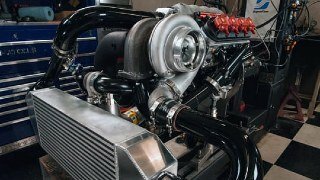 EARLIER WE TOLD YOU WE WERE GONNA BE HELPING THE GUYS OUT AT POWERTRAIN PRODUCTS INTRODUCE A NEW PERFORMANCE CRATE ENGINE TO THEIR LINE UP. WE'LL RON LAWSON IS THEIR GENERAL MANAGER AND HE'S HERE TODAY TO HELP US OUT AND GIVE US HIS IDEAS ON THIS NEW ADDITION. 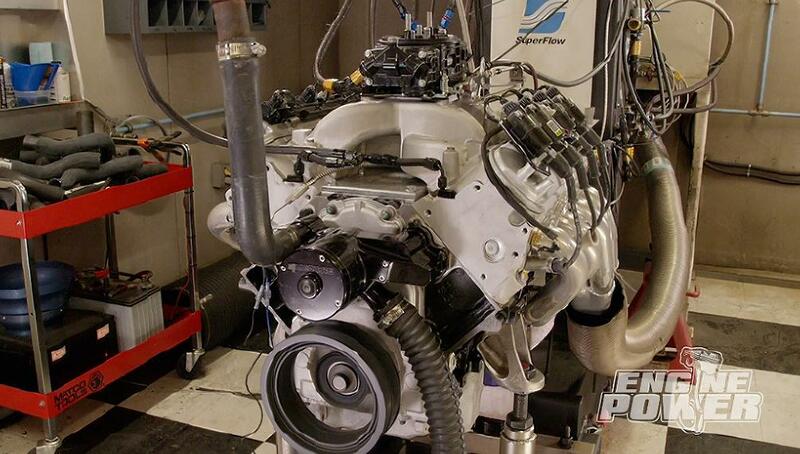 RON POWERTRAIN PRODUCTS SPECIALIZES IN REMANED ENGINES FOR ALL MAKES AND MODELS. WHY ARE YOU GUYS GETTING IN THE PERFORMANCE SIDE? (RON)>> WE GET A LOT OF REQUESTS FROM OUR CUSTOMERS LOOKING FOR SOMETHING A LITTLE OVER STOCK. SO BECAUSE THE LS MARKET IS SO HOT RIGHT NOW AND THE FIVETHREES, THE LS SERIES IS SO EASY TO MAKE POWER WITH WE DECIDED TO GO AHEAD WITH THIS PLATFORM TO MOVE INTO THE PERFORMANCE SIDE OF THE MARKET. (MIKE)>> COOL, FINDING CORES ISN'T GONNA BE A PROBLEM. (RON)>> NO, NOT AT ALL. WE HAVE PLENTY OF CORES TO BUILD THEM. (MIKE)>> IN THE FUTURE YOU'RE LOOKING AT SIXZEROS, AND FOUREIGHTS, AND ALL THOSE OPTIONS TOO. (RON)>> YEAH, IF EVERYTHING TAKES OFF WITH THE FIVE THREE WITH THIS PARTICULAR SETUP THEN IN THE FUTURE WE MAY START EXPLORING THE SIXZERO AND MOVE ALONG FROM THERE. (RON)>> I'D LIKE TO BREAK INTO THE 400 MARK. (MIKE)>> THAT'S GOOD, I DON'T THINK WE'LL HAVE A PROBLEM WITH IT. (RON)>> NO, I HOPE NOT. 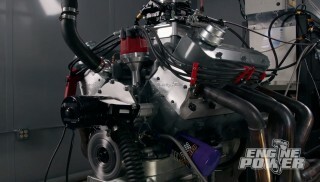 (MIKE)>> PAT'S GOT THIS THING ALL JAZZED UP ON THE DYNO. SO WE CAN GO IN THERE, SEE WHAT IT'S ALL ABOUT, AND GET A BASELINE. (PAT)>> THE RECIPIENT OF TODAY'S POWER INCREASE IS THIS 2006 LMSEVEN FIVE POINT THREE LITER TRUCK ENGINE. NOW THESE ARE KNOWN FOR THEIR IMPRESSIVE STRENGTH AND GREAT LONGEVITY WHEN THEY'RE TAKEN CARE OF PROPERLY. THIS ONE'S BEEN DRESSED WITH SOME SHORTY HEADERS, A DUAL PLANE INTAKE AND 650 CFM CARBURETOR, BOTH FROM HOLLEY, AND AN ELECTRIC WATER PUMP. NOW FOR COMPARISON REASONS WE ALWAYS DO A BASELINE RUN BECAUSE THAT'S THE FIRST PART OF THE EQUATION. 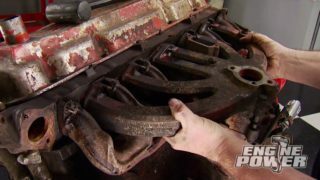 (MIKE)>> WE ALREADY RAN THIS ENGINE FOR SEVERAL MINUTES WITH DIFFERENT PERCENTAGES OF LOAD APPLIED FOR PROPER RING BREAK IN AND SEATING. NOW WE'RE GONNA MAKE THE PULLS FROM 2,500 TO 6,000 RPM. THIS ENGINE MADE 285 HORSEPOWER AND 325 POUND FEET OF TORQUE FROM GM. SO WE'RE GONNA SEE HOW IT DOES AND EVEN LET RON RUN THE CONTROLS. SEAT BELT ON? 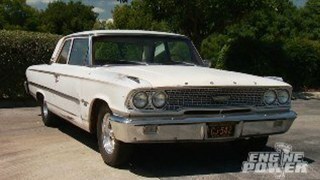 (MIKE)>> 94 POUNDS OF OIL PRESSURE AT 6,000. (PAT)>> OH MY GOODNESS. THE BASELINE NUMBERS ARE VERY RESPECTABLE, 312 HORSEPOWER AT 5,400 RPM, 366 POUND FEET OF TORQUE AT 3,800 RPM. THIS EXCEEDS THE FACTORY RATING BY A NICE MARGIN. (MIKE)>> COOL, GOOD BASE LINE. BUILD UPON THAT. (PAT)>> EASY AS THAT, AND WE'VE GOTTEN THESE FROM YOU BEFORE. EVERYTHING ALWAYS RUNS SPECTACULAR. SO ALWAYS HAS GOOD OIL PRESSURE, NO PROBLEMS AT ALL. SO NOW THE FUN PART IS. NOW WE CAN CHANGE A COUPLE OF PARTS AND SEE WHAT WE PICK UP. 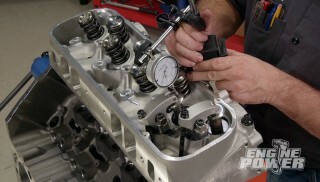 (PAT)>> POWERTRAIN PRODUCTS OFFERS THE LS POWER PLANT IN A LONG BLOCK SETUP, LIKE THE ENGINE WE JUST DYNOED. THEY ALSO OFFER AN UPGRADED PACKAGE WHICH INCLUDES A PERFORMANCE CAM SHAFT AND VALVE SPRING UPGRADE. AN UPGRADE LIKE THIS WILL YIELD MORE VALVE LIFT AND HOLD THE VALVE OPEN LONGER FOR MORE AIR FLOW THROUGH THE ENGINE, WHICH WILL MAKE MORE POWER. (MIKE)>> THE BEST THING IS BOTH THE CAM AND SPRING UPGRADES ARE PREINSTALLED BY POWERTRAIN PRODUCTS BEFORE THE ENGINE SHIPS TO YOU, AND THE ENGINE ALSO CARRIES A WARRANTY. THE PERFORMANCE VERSION DOES NOT REQUIRE THE HASSLE OF RETURNING A CORE. WITH THE INCREASED AIR FLOW DUE TO THE CAM UPGRADE WE ARE STEPPING UP TO OUR RUNS GOOD ON EVERYTHING 950 DYNO CARB. RON MENTIONED HE'S ALWAYS WANTED TO RUN A DYNO. SO WE'VE GOT HIM AT THE HELM. (PAT)>> ALL RIGHT, ARE YOU READY? THIS IS FIRST DYNO PULL RON, ARE YOU EXCITED? (RON)>> I AM, LET'S DO IT! (PAT)>> RIGHT BACK TO THE STOP. NICELY DONE, NICELY DONE. WELL LET'S SEE WHAT WE'VE GOT HERE. 401 HORSE, 392 POUND FEET OF TORQUE. (PAT)>> HOW ABOUT THAT NUMBER? WE JUST TOOK A STOCK FIVETHREE, STOCK BLOCK, STOCK HEAD, PUT A LITTLE BIT SPICIER CAM IN IT, MANIFOLD AND CARB, 400 HORSE. (MIKE)>> TORQUE'S IMPRESSIVE ON THIS ONE. (PAT)>> THE WHOLE THING IS IMPRESSIVE, AND I THINK YOU GUYS ARE GONNA SELL A LOT OF THESE THINGS. THIS IS GONNA BE A HOMERUN. (RON)>> YEAH, THAT'S WHAT WE'RE HOPING FOR. THAT'S EXACTLY WHAT WE WANTED TO DO. (PAT)>> THANKS FOR COMING BY. NICE JOB MAN. (NARRATOR)>> UP NEXT, SONNEN SENT US ONE SERIOUS CYLINDER HONE, AND WE CAN'T WAIT TO USE IT. (MIKE)>> WE'RE OUT HERE ON THE POWERNATION SHIPPING DOCK AND HAVE A BIG NEW PIECE OF EQUIPMENT IN THIS CRATE. IT'S A VITAL PIECE TO THE MACHINING INDUSTRY AND WE GET TO ADD IT TO OUR EQUIPMENT LINE UP IN OUR SHOP. (PAT)>> WELL WHAT'S UNDER THE BLUE PLASTIC? LOOK AT THAT. THIS IS ONE OF MY FAVORITE MACHINES OF ALL TIME. IT'S LIKE A BIG GIANT CHRISTMAS PRESENT. BEHOLD THE SONNEN SV-15 HONE MACHINE. NOW LET'S GET IT IN THE SHOP AND TAKE A CLOSER LOOK. OKAY, I'M GONNA TAKE HER SLOW. I'M SLOW BUT I'M ACCURATE. (MIKE)>> YOU'RE GONNA GET TIGHT OVER ON YOUR LEFT SIDE. (PAT)>> YEP, THIS MACHINE IS A BEAST WEIGHING ROUGHLY 2,000 POUNDS BUT IT'S VERY THOROUGHLY AND THOUGHTFULLY PACKAGED, MAKING IT EASIER TO GET INTO THE SHOP THAN YOU MIGHT THINK. OH THAT BABY'S HEAVY. EVERYTHING'S GOOD? TO ITS NEW HOME. I DON'T WANT TO GET UP TOO CLOSE TO THAT RAIL. WHEN DOING ENGINE MACHINE WORK A CYLINDER HONE PERFORMS A COUPLE OF DIFFERENT TASKS. FIRST OFF IT REMOVES A SLIGHT AMOUNT OF MATERIAL AFTER THE CYLINDER HAS BEEN BORED TO RACH ITS FINALE DIAMETER, BUT MORE IMPORTANTLY IT CREATES A CROSS HATCH PATTERN IN THE METAL SO IT HOLDS OIL TO THE CYLINDER ITSELF. AND THAT LUBRICATES THE CYLINDER AND PISTON RINGS, AND HELPS FORM A TIGHT SEAL BETWEEN THE TWO. SONNEN HAS BEEN AN INDUSTRY LEADER IN BOTH AUTOMOTIVE AND INDUSTRIAL HONING FOR ALMOST 100 YEARS. 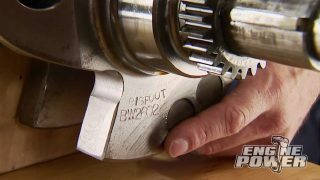 THIS PARTICULAR MACHINE CAN HONE CYLINDERS FROM 750 THOUSANDTHS ALL THE WAY UP TO EIGHT INCHES IN DIAMETER, DEPENDING ON THE TOOLING THAT IS USED. IT CAN ALSO HONE CYLINDERS UP TO 11 INCHES IN LENGTH, AND WHEN IT'S RUNNING THIS MONITOR WILL DISPLAY A REAL TIME PICTURE OF THE BORE'S PROFILE. 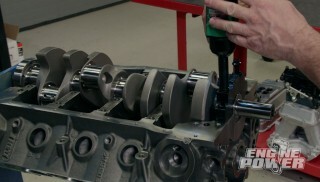 YOU CAN SEE IF THE CYLINDER IS TAPERED IN ANY SPOT, MAKING IT EASIER TO CORRECT IT. LIKE ANY PIECE OF COMPLEX INDUSTRIAL EQUIPMENT, WE NEED TO LEARN THE INS AND OUTS OF THIS MACHINE BEFORE WE USE IT. THE CREW FROM SONNEN WILL PAY US A VISIT SOON TO SHOW US THE ROPES, AND WE CAN'T WAIT TO GET HANDS ON EXPERIENCE WITH THIS CYLINDER HONE. FOR MORE INFORMATION ON ANYTHING YOU'VE SEEN TODAY VISIT POWERNATION TV DOT COM. HOT RODS ARE USUALLY THE THING THAT YOU HEAR BEFORE YOU SEE. SO ARGUABLY THE EXHAUST NOTE MAKES THE FIRST IMPRESSION. MAGNAFLOW'S PERFORMANCE SERIES MUFFLERS HAVE A UNIQUE TONE THAT SETS THEM APART FROM THE COMPETITION. PLUS THEY'RE PACKED WITH FEATURES. THEY'RE MADE FROM HEAVY GAUGE STAINLESS STEEL, HAVE A STRAIGHT THROUGH PERFORATED CORE FOR INCREASED FLOW, TWO STAGE HIGH TEMP PACKING, AND ARE FULLY WELDED. THEY'RE ENGINEERED FOR REDUCED BACK PRESSURE TO HAVE MAXIMUM PERFORMANCE AND COME IN A WIDE VARIETY OF CONFIGURATIONS TO FIT JUST ABOUT ANY PROJECT THAT YOU'RE WORKING ON. PLUS THEY'RE MADE RIGHT HERE IN THE USA AND CARRY A LIFETIME WARRANTY. 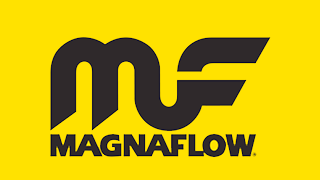 CHECK THEM OUT AT MAGNAFLOW DOT COM. (MIKE)>> TODAY WE ARE GONNA TALK ABOUT LUBRICATION. NOW MOST AUTOMOTIVE MACHINERY HAS METAL TO METAL CONTACT DURING ITS OPERATION. WE PRIMARILY DEAL WITH ENGINES AND DRIVETRAINS, WHICH ARE PRETTY COMPLEX PARTS. NOW THEY BOTH HAVE METALLIC PARTS THAT RUB AGAINST EACH OTHER IN DIFFERENT WAYS. NOW TO KEEP THOSE PARTS FROM FLAT OUR WEARING OUT OR BEING DESTROYED PROPER LUBRICATION IS NECESSARY. DIFFERENT PARTS HAVE DIFFERENT LUBRICATION DEMANDS. ON THE ENGINE SIDE WE HAVE MAIN, ROD, AND CAM BEARINGS, PISTON RINGS, AND VALVETRAIN COMPONENTS LIKE A CAM SHAFT, LIFTERS, AND TIMING CHAIN. THESE ALL REQUIRE THE SAME LUBRICATION, ENGINE OIL. THERE'S ALMOST AN INFINITE AMOUNT OF OILS TO CHOOSE FROM NO MATTER THE APPLICATION. THERE'S OILS FOR STREET USE, RACE USE, AND EVEN HIGH MILEAGE. NOW THE MOST IMPORTANT PROPERTY OF MOTOR OIL IS KEEPING A LUBRICATING FILM BETWEEN THE MOVING PARTS, AND THAT'S CALLED ITS VISCOSITY. VISCOSITY IS THE FLUID'S RESISTANCE TO FLOW. MULTI VISCOSITY OILS ARE CREATED SO OIL FLOWS ADEQUATELY AT DIFFERENT TEMPERATURES. WHEN READY VISCOSITY NUMBERS KEEP IN MIND THAT A HIGHER NUMBER REFERS TO MORE VISCUS, OR THICKER OIL. WHEN YOU SEE 20-W-50 HERE'S WHAT IT MEANS. THE "W" MEANS THE OIL HAS A WINTER RATING. THE "20" IS THE VISCOSITY AT ZERO DEGREES FAHRENHEIT, WELL BELOW FREEZING. THE "50" IS THE VISCOSITY AT 212 DEGREES FAHRENHEIT. THIS IS AN SAE RATING FOR MULTI VISCOSITY OIL. IN ADDITION TO ALL THE CHOICE OF ENGINE OIL YOU CAN USE THERE ARE ALSO SEVERAL BRANDS AND VISCOSITIES OF SPECIALIZED LUBRICATIONS THAT AID IN ASSEMBLY, START UP, AND BREAK IN PROCEDURES. ASSEMBLY LUBE IS HIGH IN VISCOSITY. ITS PURPOSE IS TO NOT ONLY PROTECT THE ENGINE DURING INITIAL START UP BUT ALSO STAY IN PLACE IF THE ENGINE SITS FOR A WHILE. BREAK IN OIL IS EXACTLY THAT. IT CONTAINS HIGHER LEVELS OF SPECIAL COMPOUNDS LIKE ZDDP OR ZINC, AND IT IS ALSO PHOSPHOROUS FORTIFIED. THIS IS SUPER IMPORTANT IN FLAT TAPPET CAM SHAFT SCENARIOS THAT HAVE VERY HIGH BOUNDARY LAYER PRESSURES AND SHEER FORCES AT THEIR CONTACT FACES. THE ZINC IS ATTRACTED TO THESE AREAS TO ADD ADDITIONAL LUBRICATING PROPERTIES, AND ALSO ACTS AS CORROSION INHIBITOR. THEN WE HAVE THE DRIVELINE SIDE. NOW LUBRICANTS FOR THE DRIVELINE HAVE TO DEAL WITH EXTREME PRESSURES, LIKE GEAR MESH AND BEARING LOADS. NOW THEY DO HAVE THE SAME TYPE OF SAE RATING AS MULTI WEIGHT OILS JUST A MUCH HIGHER VISCOSITY. HOPE THIS GIVES YOU A BETTER UNDERSTANDING OF THE IMPORTANCE OF DIFFERENT LUBES, THEIR VISCOSITIES, AND THE AMOUNT OF SCIENCE INVOLVED TO KEEP YOUR PARTS PROTECTED.